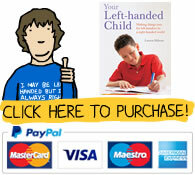 Click the button to purchase the Ebook version of Your Left-Handed Child for only £9.95. PayPal, Credit or Debit cards. You must click that image to return to this site and download your guide. 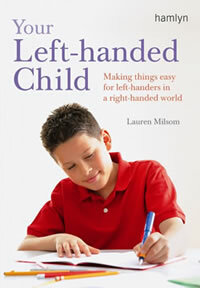 Our own Lauren Milsom was approached as a leading authority on handedness, and commissioned by international publisher Hamlyn to write a detailed guide to life as a left-handed child and giving advice to parents and teachers. The result was the book "Your Left-Handed Child". Essential skills such as writing and cutting are covered in detail with beautiful illustrations and clear, concise explanations. However, this book goes much further than any previous work into the many and varied challenges your little left-hander will encounter on a daily basis, from starting to feed themselves to their senior school years. Lauren offers simple advice and techniques - many drawing on the strengths left-handers share for lateral and creative thinking, and building on our inherent adaptability to overcome and avoid myriad small frustrations. The aim is to ensure your child develops a positive approach to problem-solving, and always considers their left-handedness a strength rather than a problem. The need for such guidance has become increasingly obvious in recent years. 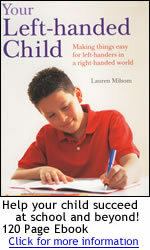 Drawing on results of a unique study among left-handed students, this book details difficulties and bias in areas of the curriculum not previously considered as prblems, but which affect many left-handed students on a daily basis. Computer Mouse - If your left-handed student has more control of the mouse in his left hand, add a simple piece of software to the desktop to swap the functionality of the two buttons so they work correctly in the left-hand. Desk positioning - To avoid knocking elbows and cramped desk space, sit left-handed students at the left of a double desk, or at the left end or a row. If chairs with hinged writing tablets are used, always ensure there are enough left-handed ones for those students who need them - remember they are often too embarrassed to ask, and should never be sent off round the school looking for the odd left-handed desk that might be spare. 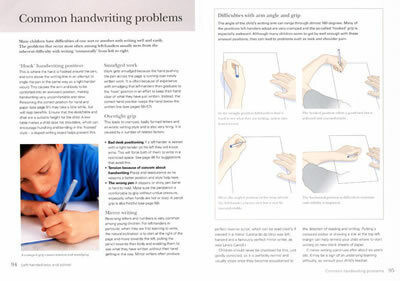 Workbooks and binders - Printed workbooks or test papers often have the questions in the left column and answer space on the right, so left-handers are constantly covering up the questions, or they may be too far to the left of the desk to read easily. A second question sheet positioned to the right of the answer space can help. The bindings, and spiral binding on pads are underneath the left-hand, so if note taking is uncomfortable your child could try making Mind Maps with the notebook turned landscape - it also appeals to lefties creativity and visual thinking. Using the whiteboard - Left-handed students should stand at the right of the whiteboard, with their writing arm out to their left and underneath their writing or drawing. Otherwise, their hand will follow behind their work, and immediately erase what they are writing! Science - Left-handers pour and stir with their left hand so keep all chemicals, ingredients and tools to the left during experiments. When working in pairs, the left hander should stand to the left to avoid knocking elbows. Microscopes and other equipment with controls on the right side are harder for the left hander to reach and control. Design Technology / metal / woodwork - Check safety overrides on heavy machinery and power tools can be reached by a left-hander in an emergency. They are usually positioned for a right-hander’s safety so can be hard for lefties to reach. Workshop and equipment layout for right-handers' ease often means left-handers don’t have room to work, so attempt to use powerful and dangerous tools backwards by crossing their arms over their body or using their weaker hand - both very dangerous. Food Tech - As with kitchens at home, many food preparation implements such as kitchen scissors, peelers, can openers and serrated knives are right-handed, and thus awkward to use for a left-hander, slowing them down and causing more accidents. 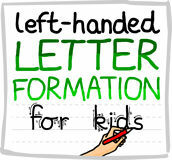 "Your Left-Handed Child" is an invaluable handbook that you will keep referring to through the many stages of your child's life. For the past 20 years Lauren Milsom has helped her family run the world's original left-handed shop - the much loved Anything Left-Handed Shop which was in central London since 1968 - only closing it last year to concentrate on the company’s successful worldwide internet business. 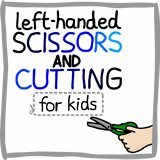 Lauren is a leading expert on many aspects of left-handedness and, with her husband Keith, formed the Left-Handers Association in 1989, a pressure group and information source for improvements in product design, teaching of writing and other skills. In 1990 she was instrumental in the launch of Left-Handers Day, an annual awareness day on 13th August which is still celebrated by sinistrals worldwide to highlight the creativity, artistic talent and adaptability of left-handers. She runs the advice and information pages on left-handed websites www.anythinglefthanded.co.uk, www.lefthandedchildren.org and www.lefthandersday.com and contributes to the monthly e-newsletter sent to over 120,000 Left-Handers Club members worldwide. Lauren is a regular guest on TV and radio discussions and writes articles for health, education and family publications. 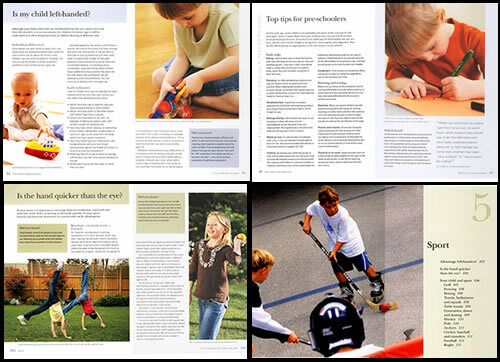 Click the button below to get your own copy of Your Left-Handed Child for only £9.95 and print out the high-resolutions guide pages from the PDF file as often as you like. As soon as your payment is made you will be returned to the page on our site where you can download your guide immediately - you could be enjoying it with your child in less than 5 minutes! You can use your PayPal account to make the payment or to use a credit or debit card click on "Click here to purchase" then on the button for "If you do not currently have a PayPal account Click Here". You can then enter details to pay securely using most credit and debit cards.